No matter how skilled you are, how experienced, how many years you've been in business, or how much you love what you do, if you do not have a commanding presence on every platform, you will continue to struggle, continue to be underpaid and under-recognized, and continue to labor to attract recognition. The ability to speak and communicate with confidence and charisma is the single, critical factor that eliminates each of those obstacles more quickly than anything else. - Instead of having to find your public, the public finds you. - You no longer have to seek partners, you choose the ones you want to work with. - Most important, you no longer have to beg people to work with you, they beg you to work with them. Best of all, you attract raving fans who will gladly pay you what you're worth. Speakrets(R) is all about that, and more. 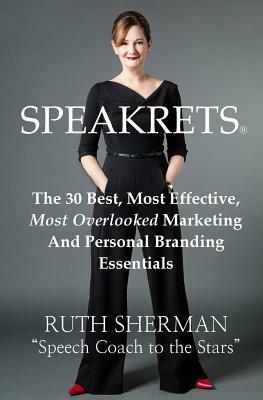 Ruth Sherman is a strategic communications consultant who works with corporate leaders and international public figures. Her clients hail from the A-List of international business and Hollywood. Three clients have won Oscars and one the Pulitzer Prize. Ruth Sherman, M.A., has been a public speaking coach and strategic communications consultant for over 18 years. Ruth's focus is preparing CEOs and other C-level executives, business leaders, politicians and celebrities to leverage a variety of critical public communications including the writing and delivery of keynote speeches, webcasts, investor presentations, road shows, awards presentations, political campaigns and media contact. Her clients hail from the A-list of international business including General Electric, JP Morgan (NY, London, Frankfurt), Timex Group, Deloitte and Istithmar (Dubai). Two of her clients have won Oscars and one, The Pulitzer Prize. RSA's company headquarters are in Greenwich, CT and there is a satellite office in Los Angeles to serve her celebrity clientele for media training, consulting and coaching. As a professional speaker, Ruth is highly sought after and has addressed many associations including the American Society for Training & Development (ASTD National Conference and Expo, '08, '09, '10), National Investor Relations Institute (NIRI) and the National Speakers Association (NSA National Conference '07 & '08), Network Services Company Annual Conference and Expo, and Insurance Conference Planners Association (ICPA), . She is regularly contacted by the press and has been featured in the New York Times, Washington Post, National Journal, New York Post, Wall Street Journal, Miami Herald, San Francisco Chronicle, on ABC, MSNBC, CNBC, Fox, the BBC and NY 1 where she was a recurring commentator on the communication, presentation and public speaking skills of the participants on the reality TV show, The Apprentice, starring Donald Trump. Ruth is a Fast Company Magazine "expert blogger" and posts regularly on executive leadership and strategic communications. You can read her posts at http: //www.fastcompany.com/blog/ruth-sherman/lip-service. Ruth Sherman is the author of the best-selling book Get Them To See It Your Way, Right Away: How to Persuade Anyone of Anything (McGraw-Hill). In it, she provides tools and techniques for mastering the art of influence and persuasion, based on her belief that charisma is a learned skill and that every contact we have with others is an opportunity to motivate, inspire and advance business and personal interests. Her book was designated a "Best Business Book" by the prestigious Library Journal and has been translated into Chinese and Romanian.